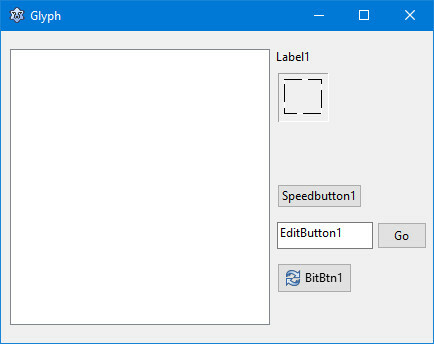 A glyph is a small bitmap image that can be displayed on a button, such as the TBitBtn, TSpeedButton or TEditButton. You can set a button's glyph in the Object Inspector by clicking next to the property Glyph. This opens a dialog that lets you load a picture from a PNG, BMP, or ICO file. Lazarus automatically converts the picture to the bitmap format. Lazarus provides some images that are suitable for glyphs, but they are scattered all over the place. So it seems like a good idea to collect a number of suitable pictures and put them in a folder, for example c:\lazarus\images\glyph. Create a new folder glyph under the existing c:\lazarus\images. Download glyphs.zip and unzip it into c:\lazarus\images\glyph. Here is a small application that shows you how to use glyphs. Start a new Lazarus project and save it as Glyph. Drop a TShellListView on the form. You find it under the tab "Misc". Under the label, add a TImage. Add a TSpeedButton, a TEditButton and a TBitBtn. In the Object Inspector, double click next to the event OnClick. Save your files and press F9. Click on one of the filenames in the list. Click on of the buttons. It's amazing how compact the code is, considering all the functionality of our little program.